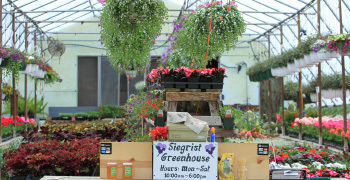 Come visit Siegrist Greenhouse on Chandler Hill, in Boyne Falls! We carry everything you need to make your home burst with color this summer season! Come choose from a wide variety of shade plants, part sun plants and full sun plants, we even offer several varieties of drought tolerant plants. If you are interested in gardening, we have everything you need to grow your perfect garden too! We offer our customers drop-off planting service. 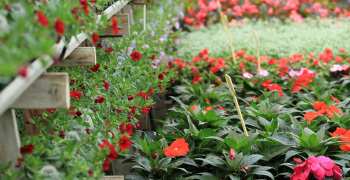 If you have several planters, hanging baskets, or window boxes that need to be planted you can just drop them off at the greenhouse, tell us what you like, and then we can plant them for you. Please contact us to schedule a drop-off for your items. Expect a couple days for turn around time. We offer the option of coming on-location to your home or business to plant garden beds, pots, planters and window boxes. If you don't have the time or knowledge to feel comfortable planting yourself, go ahead and relax, we can get it done, and you can enjoy the beauty all summer long! If you are interested in on-location planting contact us today to reserve your spot. 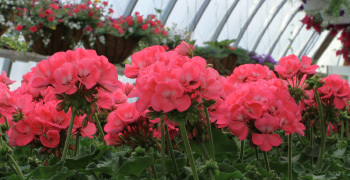 We are located on beautiful Chandler Hill in Boyne Falls, where we have 3 retail greenhouses for our customers to browse through. Our customers enjoy a clean, organized, and pleasant experience. We are located about 20 minutes from Petoskey, 15 Minutes from Walloon Lake, and 15 minutes from Boyne City. If you are interested in having us plant your pots, window boxes or hanging baskets you will need to arrange a drop-off time with us. Please either call ahead or send an email to let us know when you plan on dropping of the materials you wanted to be planted. When you drop of your materials we can also arrange for a pickup or delivery date. On-location planning jobs require some coordination between you and our team. If you are interested in having us plant at your home, cottage, or business we need to communicate to determine the dates that we have available and the dates that work best for you. Please call us at 231-549-2508 or get started by emailing us. Check out the Proven Winners website to get planting ideas, inspiration and growing tips. 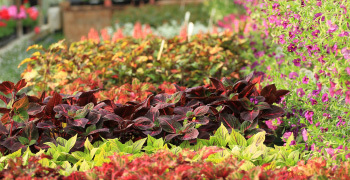 Many of our plants are proven winners products, so this is a great place to gather knowledge. The state of Michigan has a pretty wide range of climate conditions, ranging from gardening zone 5-6 all the way down to zones 2 and 3, make sure you know your zone before planning & planting your beds. Beautiful use of space, great variety, neat, clear pathways, helpful friendly staff, beautiful setting. Worth the trip. We love you all! One of our favorite parts of Spring is to come out and see all the beautiful, nicely organized flowers.